Manfred Fricke founded MFB in 1976 with a vision of creating inspiring electronic instruments, based in Berlin this small independent manufacturer has built some of the best selling and most highly regarded instruments of the last 40 years. 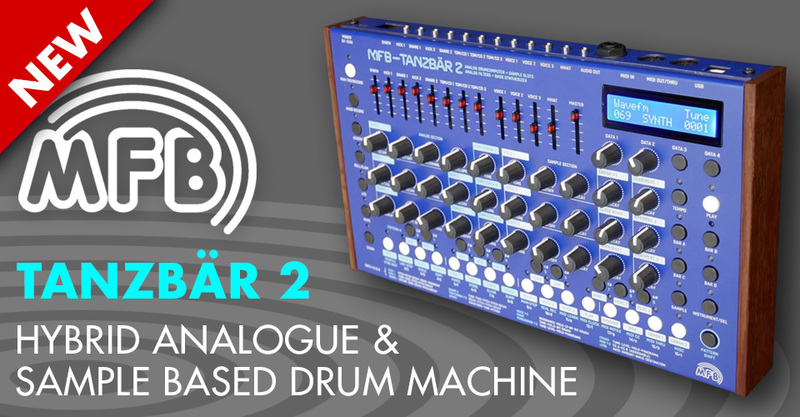 Well known for their excellent analogue synthesizers like Dominion 1, sublime analogue drum machines like Tanzbar, 522 and more recently their range of Eurorack Modules comprising of wide range oscillators, intelligent sequencers, voltage controlled filters, LFO’s and more. More recently their have evolved their product lineup with miniature drum machines derived from the Tanzbar, called Tanzbar Lite, Tanzmaus and at SuperBooth 2018 they showed off the Tanzbar 2, a hybrid drum machine that combines samples and analogue voices toegther into a single, powerful drum machine. MFB always make sure that whatever they bring to the market is unique, built like a tank and sounds incredible, we offer the complete MFB range online and in store with demonstration stock available on most occasions. So, click online or call us today for expert advice and information.